Volume 6 is Plok's Odyssey as he tries to return home from System-Z, after being banished at the end of his trial. But what's happening back home? » View all 26 episodes of Volume 6 as a single long webpage. Volume 6 is still in production. All 26 episodes will be added here as they are published, available to read for free! Wubba's new pal looks familiar. 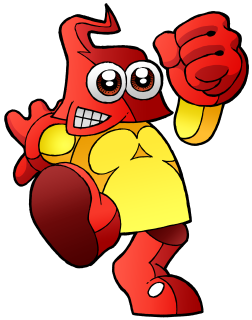 Plok is a self-proclaimed video game super-star created by The Pickford Bros.
First seen in the classic SNES platformer Plok!, he has now been reborn here in comic strip form. Plok © 1993, 2013-2018 The Pickford Bros. Plok is a trademark of The Pickford Bros.